GIANT projectiles pulled at terrific velocities through powderless cannon by magnetism, leaving the barrel with scarcely more noise than that made by a .22 rifle, may set new problems for range finders. 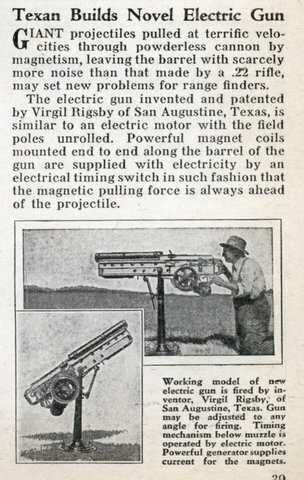 The electric gun invented and patented by Virgil Rigsby of San Augustine, Texas, is similar to an electric motor with the field poles unrolled. Powerful magnet coils mounted end to end along the barrel of the gun are supplied with electricity by an electrical timing switch in such fashion that the magnetic pulling force is always ahead of the projectile. Virgil Rigsby was my husband’s great grandfather. virgil rigsby was my grandfather. 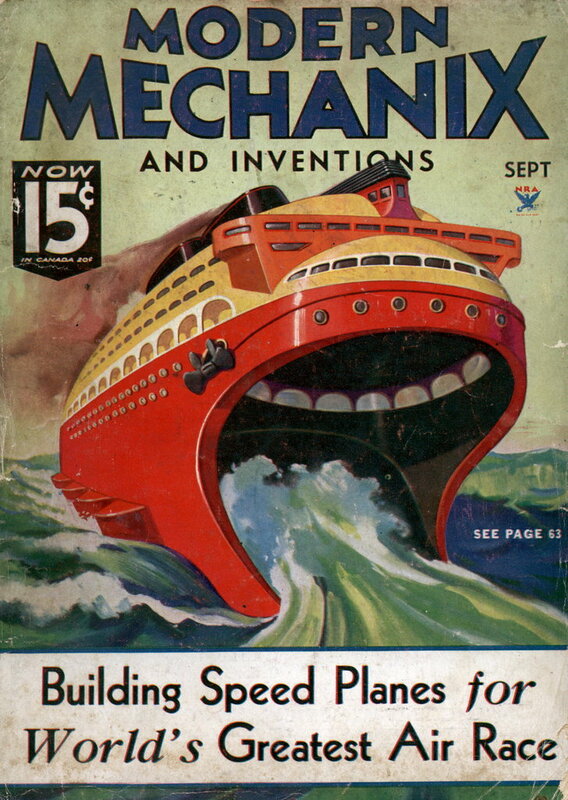 He had letters from all over the world wanting to buy the patent and gun. He was to honest of a man and was cheated out of this. he was pappy to me and passed away when i was 13. i remember going to pappy and granny’s house. i was very young and they always seemed old. pappy was also a good artist painting mostly moonlite scenes. Does anyone have any ideas where i can find more information on virgil rigsby and his gun. I am working on a report for National History Day on the Rail Gun. I had no clue about this. It is really cool. Any info would be gretaly appreciated. Wasn’t there an article posted here about this gun? Suppossedly for a silent gun it was too noisy in a demonstration. pappy was a character,according to my mom and other relatives and that gun was just one of a whole lot of things he did,he was a train engineer as best as i know,i remember pictures of his engine that mom and dad kept.by the way my cousins ,Kieth or david wright might have more information on him,i dont know exactly,but look them up. he is my great grandpa and my dads grandpa its his moms allie which whom i am named afters dad! if the gun launched the projectile through electricity running through a coil, then it was a coilgun not a railgun. a railgun is launched through two rails, and has much greater velocity and power, uses much more electricity, is a lot harder to build and when shot plasma will tail the projectile unlike the coilgun. Virgil Rigsby was my grandfather. We had a picture of him with his gun. My grandfather was very eccentric. He was very talented person, perhaps a little odd. He was my Great Grandfather I Wish i could of met him.